What exactly is a Moment of Truth and where did it come from? Shep Hyken reveals all. From this simple concept, Jan Carlzon took an airline that was failing and turned it around to be one of the most respected airlines in the industry. All of these are main moments of truth, and notice that they are all controlled by people. There are many moments of truth that are not controlled by people, such as advertisements (radio, television, billboards, newspapers, etc.). 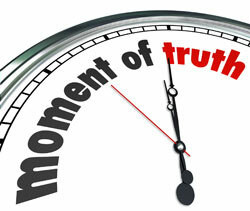 The emphasis of this article is on the moments of truth that we, as people, have control over. These are the points of contact that our customers and clients have directly with us and our organization. Mentioned above are a number of the main moments of truth, not just at Jan Carlzon’s airline, but in virtually all commercial airlines. These are the main ones. While these may be the most important, there are lots of small ones as well. For example, you might be walking toward your gate at the airport and walk by a couple Scandinavian employees. They look up and smile at you. Now that may be a small moment of truth, but it is an important one. It adds to the total experience of the customer. Disney has taken the small moments of truth to an even higher level. They understand the importance that these small moments of truth have on their customers. They train their cast members (Disney’s term for employees) to acknowledge the guest (Disney’s term for a customer) with a smile or facial expression if within ten feet. If the cast member gets within five feet of the guest, they are to acknowledge them verbally. All of the little moments of truth, combined with the major ones, with the addition of the product or service your organization is selling, add up to the overall level of a customer’s satisfaction. Jan Carlzon said there are good moments of truth and bad moments of truth. I believe there is a third type – average moments of truth. Average is middle-of-the-road – simply acceptable, but not great. I have a term for the good and bad ones. The bad ones are referred to as moments of misery, and the good ones are referred to as moments of magic. Our goal should be to create all great moments of magic, even if they start out to be moments of misery. Sometimes a customer may have a legitimate complaint. We not only need to fix problems and complaints, we also need to give customers a reason to want to come back and continue to do business with us again and again. Even if we fix a problem, it doesn’t mean the customer is coming back. For example, if you own a restaurant and one of your guest’s meals is over cooked, don’t simply fix it or take it off of the bill. Consider giving the guest a business card with a note that gives him or her a round of drinks or a free appetizer the next time they come back. At times these moments of misery may not even be our fault. The customer may just be having a terrible day. For example, a customer may be checking into a hotel. This person may have had three flights delayed and he or she is in a very bad mood. It is not the hotel’s fault the customer is unhappy due to the airline’s delayed flights. But, it is the person who is checking in this irate customer who has the opportunity to start to turn the customer’s mood around. It is an opportunity to take someone else’s moment of misery and turn it into the hotel’s moment of magic. So, manage your moments of truth. Seize every one of them, even if they are moments of misery, as opportunities to show how good you and your organization are. This will go a long way in building long-term customer loyalty and total customer satisfaction. Can Live Chat Improve Customer Satisfaction? Are You Keeping up with Your Customers?